A country full of stories of heroes and magic, courage and sacrifice, monsters and witches, a country that fought for its freedom and was made famous with the help of blue face paint, men in kilts, copious amounts of Whiskey drinking and the screaming of FREEDOM while recklessly charging against the impossible to make a point. Oh how we do love historic inaccuracies – and Mel Gibson Men in Kilts. Scotland is the wonderful place I can call home in between traveling adventures. A beautiful country offering everything from dramatic coastlines, never-ending forest trails, adventure sports, magical worlds, mountainous regions, castles, bustling cities, quiet villages and fairy tales come to life. It is no surprise tourism in Scotland is booming, now even the ‘locals’ are becoming ever more inspired to go out and explore the country they live in, along with those coming from the other side of the planet. So you’re coming to Scotland?! Whether you are short on time or travelling on an extended time frame you’ll want to see the hot spots the beautiful and the breathtaking. Spare at least a day and head over to this beautiful Island off the West Coast of Scotland. Take a hike through the beautiful landscape, over mountains and uncover the hidden mysteries here. 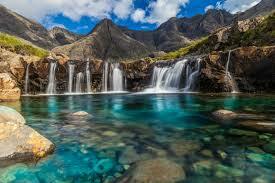 Trek further ‘off road’ and stumble upon the magical Fairy Pools of Skye. If your here in the summer and your day is hot, jump in and take a dip in the clear emerald blue waters. Soak up the magic of this beautiful island. Made it to the Fairy Pools but you still have time to spare? Head back down to the coastline, pack a cosy picnic rug, some hot soup and snacks while you sit and take in the beautiful scenery of Elgol’s boulder-strewn beach. If it’s a nice clear day you will see the mighty Black Cuillin Mountain Range in all its magnificent glory – let your imagination take over, imagine the myths of giants, fairies and witches. Ahhh the capital of Scotland. A festival lovers fantasy, a foodies dream and history buffs blessing. 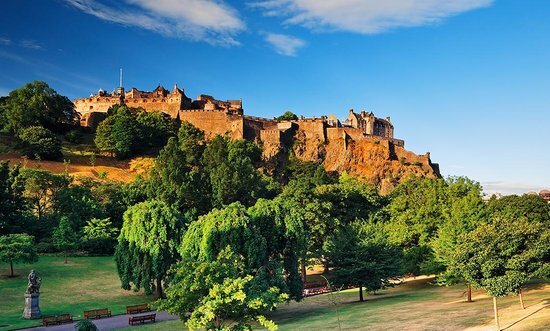 Edinburgh offers something for everyone at all times of the year. Known for having one of the best New Years Eve Street Parties around and hosting one of the UK’s best and biggest talent festival attracting artisans, entertainers and thinkers a like from all over the world. Many of the big stars we watch now have played on the ‘Fringe’ – Graham Norton & Billy Connolly to name a few – and this is one festival you don’t want to miss out on. It lasts a week and even if you are flat-out broke there are numerous free shows – some good, some bad, but all good fun right? – as well as a selection of performances on the Edinburgh Mile throughout the day. Every other sign is advertising a different restaurant you are spoiled for choice for eateries in Edinburgh – even the most fussy of eaters will manage to find something catering their needs – you have everything from basic burger joints, beautiful international cuisines to Michelin Starred Restaurants hosting some of the Best Chefs from around the world. Once you have eaten your weight – or spent most of your money– in food take a wander through the beautiful historic streets, winding your way to the magnificent Castle. There are many ‘hidden passageways’, underground passageways and never-ending staircases taking you to another ‘layer’ of Edinburgh. Get beautifully lost while taking in the history and uncovering ‘off the beaten track’ spots to enjoy. If you’re feeling brave head over to Blair Streets Underground Vaults and head down into the haunted Catacombs of Edinburgh and the ‘hidden city’ underneath the pavement above – Just watch out for those pesky ghosts! Don’t deny it. I fully believe there isn’t a person alive who doesn’t secretly love the Harry Potter Series and doesn’t wish that a Hogwarts letter would come flying through their door by Owl Mail. Well the time to travel to Hogwarts is now! Starting from the base of Ben Nevis in Fort William this breathtaking 6 hour train journey will take you through some of the most scenic, dramatic and magical landscapes of Scotland. 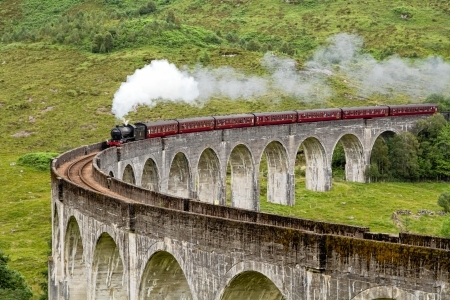 Get excited when you cross the Glenfinnan Viaduct – featured in the Harry Potter Movies – while soaking up the tremendous views before passing the Silver Sands in Morar, finally arriving into Mallaig. Book this train in advance, it is a hugely popular journey and only runs in the Summer months. Top Tip: Try to sit on the left hand side of the train for the best views continually. Have a sharp eye and a sense of Adventure? Head out to Loch Ness to spot the Elusive Loch Ness Monster. The Largest body of fresh water in the UK. In some areas it has a depth of more than 200 meters and stretching over such a large area the water world is relatively unexplored – they say that a monster livers here? The Loch Ness Monster or ‘Nessie’ as it is more commonly named puts on a rare show and is an elusive creature. Whether you believe there is a giant water mammal – which is also hundreds, if not thousands of years old – lives in the Loch or not a trip out onto the open water will have your eyes scanning the horizon, getting excited at the tricks of waves, camera ready at all time and jumping at the sights of swans (their necks look an awful lot like Nessie’s). Get lost in an old Scottish Myth, take a look at the evidence first hand, enjoy a beautiful day out on one of the most spectacular Lochs of Scotland and help uncover the mystery that lies in the deep water below. Tired of just looking at the mountains? Well why not Conquer a Munro? Whether you are a skilled climber/hiker or a complete novice, here in the Summer or the Winter, there is a Monro for you. One of the most popular Munros and suited to both novice hikers and the pro’s is Ben Lomond. Easily accessed from the tiny village of Rowardennan – you can also do a small portion of the West Highland Way if you’d prefer – the climb path is well trodden and marked with more than 30,000 people conquering the top of this beautiful mountain each year, you can trust you’re in for a good view at the top. The Summit offers spectacular panoramic views over Loch Lomond and it’s islands. Even long after winter has departed Scotland there is often snow drifts left on the rugged cliff drops, making for spectacular photos – I hiked up Ben Lomond in Spring and a Man and his wife from Hong Kong were so excited to see Snow (they thought they had missed it all) we were taking pictures for ages. – and an amazing adventure and story to return home with. To get back down you can retrace your steps or take the rugged road less followed (more for slightly keen hikers) – all the information about this walk can be found on Walk Highlands. 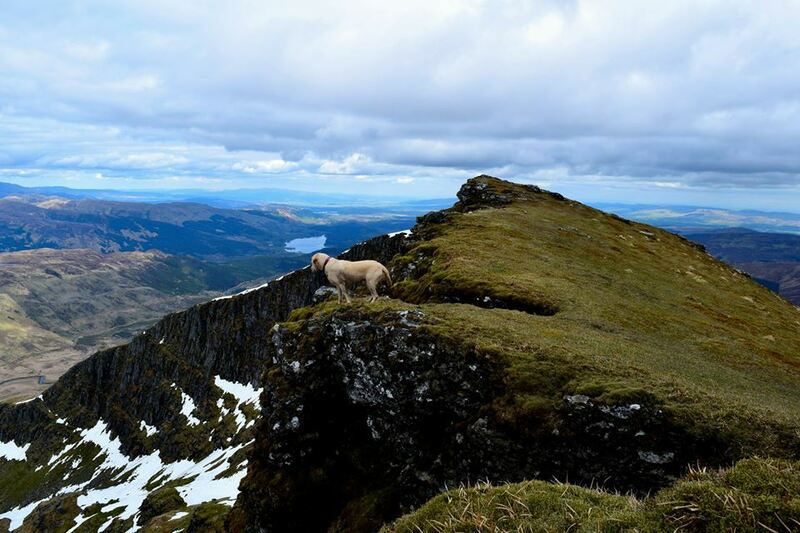 As this is one of the most popular Munro hikes you are unlikely to be alone at the top. Great for Solo hikers wanting pictures, people are more than happy to oblige, and always good if you’re a little unsure whether you’ve taken a wrong turn. Top Tip: If you are heading up here in summer, it may be warm but when you get to the top it will be cold, always carry a rucksack with a windproof jacket and an extra jumper to protect you from chilling too much. So you want to see all the best Scotland has to offer as mentioned above and more? Why not check out the amazing North Coast 500 Road trip map. This is perfect for Solo Travellers, Group Travellers, those that like to camp and those that like luxury in some of the most beautiful parts of Scotland. Voted one of the best road trips to take in the world and often referred to as Scotland’s answer to Route 66 you won’t be disappointed. Give yourself at least a week – you won’t regret it and it includes a lot – if not most – of what I mentioned above! Have you been to Scotland? What did you get up to while you were here? Great post! Going to save this one to reread when we get to Scotland! Thanks girl! When are you guys heading here?